I made this bag over the course of sunday night and monday during the day. it gave me a chance to try out some things I've been wanting to try. it's not great, but I think it turned out pretty well! note: this bag does not have different sized pockets in the front and back, they are the same size for ease of a tutorial. if you would like a larger front/back pocket you'll need to extend the tabs on the sides and bottom of the front/back piece, creating a larger square that you will sew up in step 6. remember to also increase the dimensions of your outer fabric to compensate for the larger lining. at its roots, this bag is basically a combination of the jordy square bottomed bag tutorial and the lined zippered pouch tutorial. so if you're already familiar with those, you're a step ahead! the bag I made was 12 x 9 x 4 in. the dimensions I list correspond to that bag, but it should be simple to change these measurements. they include a seam allowance of 5/8 in. iron all your fabric - a good bag requires that extra step. in fact, it's a good idea to keep the iron handy and iron it often. using fabrics (a) and (b), follow steps 1-6 in the lined zippered pouch tutorial. top sew the inner lining to the zipper on each side as you go. flip it around so that the zipper is right side out (it is not necessary to keep the zipper open). line up the bottoms of the two larger lining pieces (c) and (d) with the bottom of the zippered divider (so that the divider is sandwiched). the two larger lining pieces should have their good sides towards the divider. there should be 6 layers of fabric (lining, lining, divider lining, divider lining, lining, lining). sew across the bottom. do not sew all the way to each end so that you leave a seam allowance for sewing up the sides (about 5/8 in). now line up the sides of the larger lining pieces with the sides of the divider. sew the side seams. pinch together the corners of the lining and sew across it like steps 4-5 of the jordy square bottomed bag tutorial. do this to BOTH corners of the lining (unlike the jordy tutorial). now is a good point to zig zag all of the seams you have sewn. this will prevent fraying and help make the bag stronger. you're now done with the lining! congrats! cut the webbing into two pieces 36 in long pieces. zig zag the ends to prevent fraying. center one piece of webbing on the right side of the outer fabric (e). the webbing should over hang the flap end by about 2 in. sew along each edge of the webbing to attach it to the outer fabric. do NOT sew the very ends - end sewing 1.5 in from the edge of the flap edge and about 6.5 in from the other edge. fold your outer piece in half, right sides facing each other. sew the sides, like step 3 of the jordy tutorial (do NOT sew the bottom since it already once piece of fabric). pinch the corners of the outer fabric and sew BOTH of them as we did before. again, now is a good point to zig zag the seams you have sewn. leaving the outer piece turned inside out, flip the lining so that the right side of the fabric is on the outside. place the lining inside the outer piece. place the second webbing piece (the strap) between the two layers, leaving a small portion poking up on each side of the bag. sew the two pieces together. do NOT sew the very center of the flap - this is the hole you'll use to turn the bag right side out. again, now is a good point to zig zag the seam you have sewn, along with the unsewn portion of the flap (be careful to zigzag each layer separately since you don't want to close the hole ). turn the bag right side out. stitch around the very edge of the bag portion and flap, closing the hole in the flap as you go. do NOT stitch through the webbing on the flap. secure the strap by sewing a rectangle with cross lines where the strap is inside the bag. loop the flap end of the webbing through the top of the plastic clasp (rough end in back) and sew the loop closed. take the other end of the webbing and thread it through the other end of the clasp. fold over the webbing several times and sew through the edge (this prevents the webbing from slipping through the clasp while allowing for tightening or loosening of the bag). if you make a bag from this tutorial, please post a picture! and if you have any questions, just ask. I think your bag looks awesome. I have been wanting to make a messenger bag for myself, and now kind of feel inspired after looking at yours. I would definitely love a tutorial on how you put together the inside of your bag...heck...i would love a tutorial on the whole bag. One question, did you use a special type of fabric, i.e. nylon, or gortex, because it seems that your bag has a nice sheen to it. Also, did you reinforce your bag in anyway to handle the heavier things we might tote around? glad you liked it. to answer your questions, I used a random fabric that I had it my stash. I didn't buy it (I got it from someone else) and I don't know anything about it, but it's a fairly heavy fabric that I think is a poly cotton blend, woven from thicker white thread and thinner black shiney thread, which resulted in a gray fabric with some nice sheen. 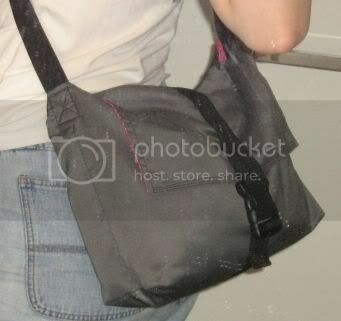 Your bag looks great, hooray for pink lining (pink and grey look so good together), I like how you did your closure too, having the top come all the way down instead of just sticking out from the bottom of the flap, seems like it would stay closed better. 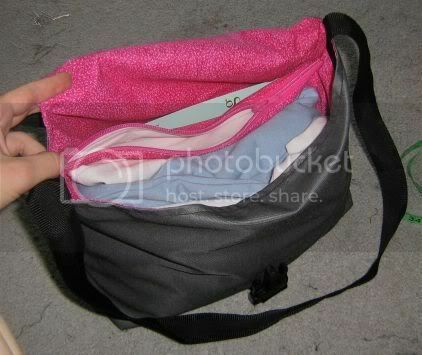 I would love a tutorial for the inside pockets, I have been looking for something with inside pockets like that to help keep all the junk you have to carry around for a toddler organized (you know, snacks, toys/books, diapers/wipes). Shop the Swap! Join Us! I love it~ tute please? sweet. looking for a bag just like this. i would love a tute for the thing start to finish. Very nice bag, looks like it'll carry just enough without being overly heavy. Can't wait to see the tutorial. I'd be interested in a tutorial for the inner part, especially since this is one of those things that I'm just afraid to try for fear I'll totally wreck it and waste time, fabric and money! The choices you make today determine the choices you will have tomorrow. no problem! I might not have a chance to make a tutorial until this weekend or so, but I promise I'll make one. Craft-aholic and not looking to quit! Crafty Weirdo and Proud of it! I would LOVE a tutorial, thank you. Looks awesome though, too.